Here’s the gorgeous Eastern Hognose (Heterodon platirhinos) snake Devin Floyd found last week about 50 yards south of the Visitor Center. Hognose snakes can appear in a wide range of colors; some are even solid black. (This one is unusually vivid; we hope it procreates lots of children.) 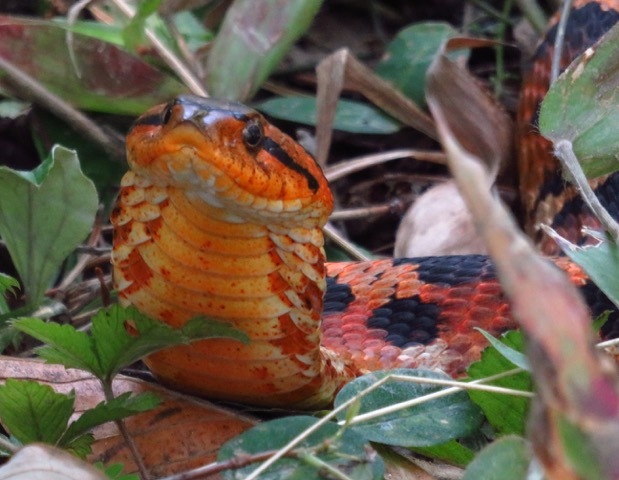 The hognose’s distinguishing features are an upturned snout—and dramatic behavior: Threatened, it flattens its head and makes to strike like a cobra. Threatened more, it rolls over and plays dead, even to lolling its tongue and emitting a foul dead-smell. 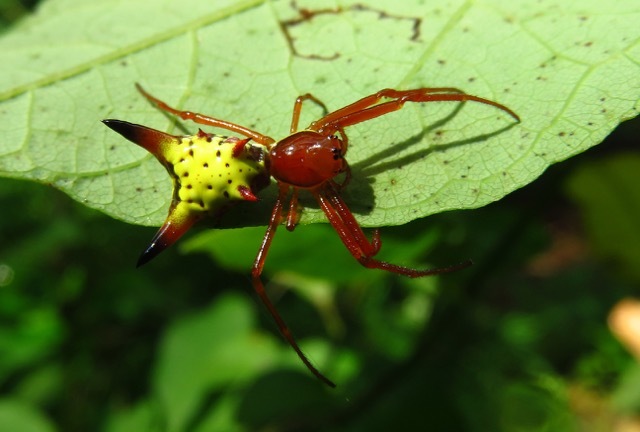 It rarely bites and is completely harmless. 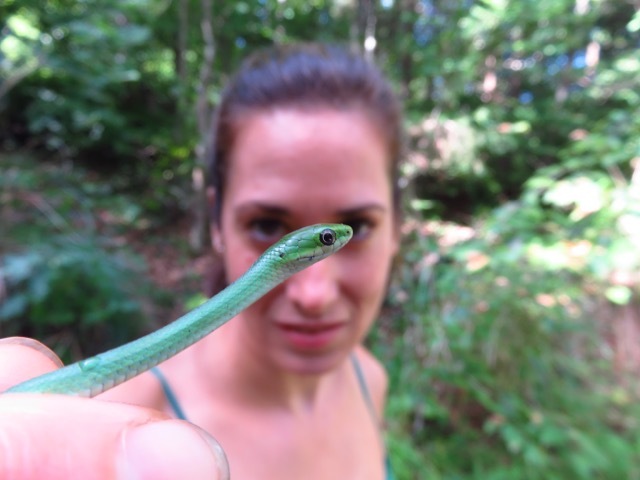 During last summer’s survey of biota, near the Giant’s Stairs, Devin and Rachel Bush found the first Smooth Greensnake (Opheodrys vernalis) reported in Nelson County (seen here with Rachel looking nonplussed). These also are benign. 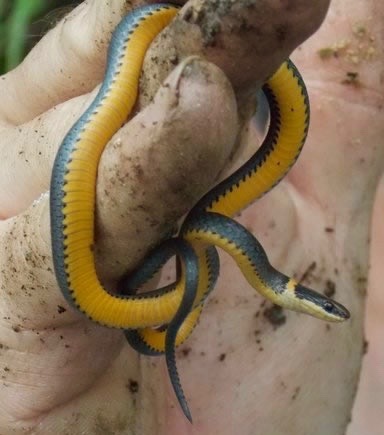 …as is the little Ring-necked Snake (Diadophis punctatis). Armand and I found one along the Quarry circling road last summer, and the Virginia Herpetological Society searchers found this one on their visit in June. Not pictured are the Eaatern Ratsnake (Pantherophis alleghaniensis) that greeted Monticello gardeners along the trail by the big reindeer lichen colony when they visited in late March, and the Northern Black Racer (Colubar constrictor constrictor) that briefly challenged Armand on the steps next to the Talus later in the spring. 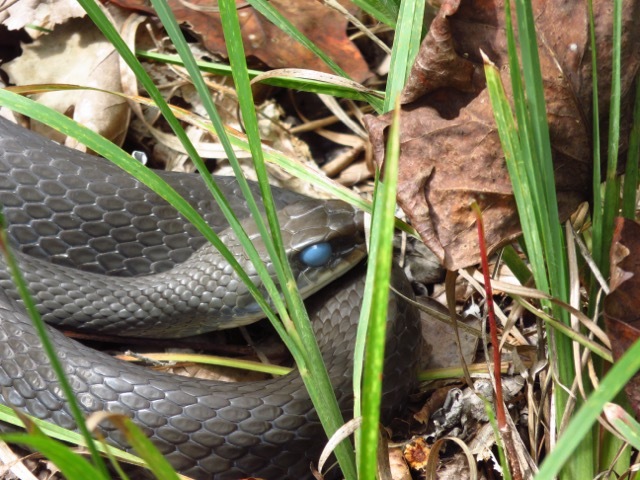 Here’s a Ratsnake that Rachel found by the Visitor Center exit last September; the blue eye and dull gray color mean it’s about to shed its skin. We’ve been fortunate to have plentiful rain most of the summer: New little plants have taken hold, and drainage has been tested. Our non-native invasives have profited, too—and now are starting to seed. Saturday morning, a generous team that included Central Blue Ridge Master Naturalists Christine Lechner, and Ellen and daughter Kira Climo, as well as friend and neighbor Buck Whitehurst, cleared lespedeza and stilt grass from the area north of the overlook platform and into the woods. The work was harder than the lead photo indicates, but the morning was pleasant and we had a good time. We’re looking forward to tackling the trailsides this week. High priority seeders will get our attention from now into September. After the leaves drop, we’ll go after Japanese honeysuckle, bittersweet, and such. We had visits from Nelson County Master Gardeners in two groups earlier in the month. Spider season seems to be peaking—best to break the trail with stick in hand. Here’s a photo of one taken during the recent survey of biota by CUH. Progress proceeds in and on the admin building. 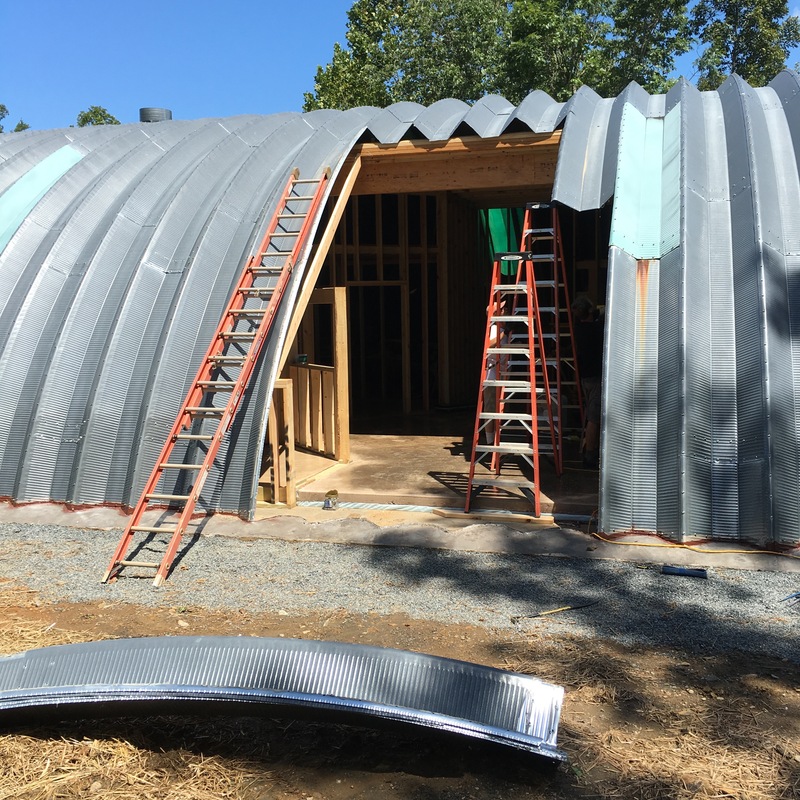 French drains have been installed on both sides, and the long front has been opened up (see photo) for the main entrance. Arrangements are under way for internet connection, electrical wiring, solar panels, well-drilling, roof vents and skylight, and audio-visual equipment and screen installations; and Mark Chase has found a saddle-tank engine similar to that actually used by the Nelson and Albemarle Railroad that will be repainted to local colors for the dioramas he’s creating.